As a nursing student at Olympic College, Sarah Christensen, ADN, ‘11, BSN ‘12, was already dreaming of helping people half a world away. In 2017, she achieved that goal, spending four months volunteering with Mercy Ships on Africa Mercy, the world’s largest non-military hospital ship. While on board, she helped women from Cameroon reclaim their lives after childbirth injuries caused them to be shunned by their villages and families. It’s easy to stay up to date with the latest OC news! 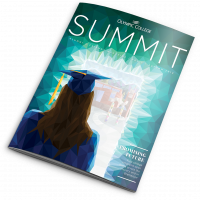 When you join the Alumni Association, be sure to subscribe to THE LOOKOUT E-News and SUMMIT magazine. And don’t forget to follow us on social media. We have special OC alumni groups on Facebook and LinkedIn.